If you are an iPhone user, you will be happy to know that you easily configure your Outlook Mail account on your iPhone. Having Outlook configured on your iPhone helps in easy access to your incoming emails and quick reply to them without any requirement to access Outlook on your computer. Not only Outlook Mail, you can also add your other email accounts to iPhone and manage them simultaneously from the phone only. 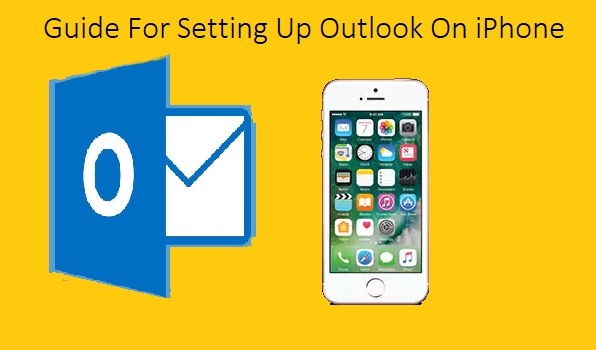 To know how to set up Outlook on iPhone, follow the step-by-step instructions provided below. Before beginning the process of setting up Outlook on iPhone, let us know about the requirements. Make sure that your iPhone is up-to-date. Make sure you have sufficient space available on your iPhone. Well, you may have ample storage and your iPhone might also be running on the latest updates, you will still need to have Outlook settings for iPhone available to set up Outlook on iPhone. Below we have provided the Outlook Settings required for setting it up on iPhone. So, once you have the Outlook settings for iPhone with you can start with instructions provided herein below. 1.) On your iPhone, tap on the Settings app icon to open it. 2.) Once the Settings app gets opened on your iPhone, tap on the Mail, Contacts, Calendars. 3.) Under Mail, Contacts, Calendars section, tap on the Add Account option. You will get a list of email services. 4.) After selecting the Add Account option, you will need to tap on the Outlook.com option from the list. 5.) On the next screen, you will need to enter your Outlook.com username and password in the prompted field and tap on the Next button located in the top-right corner of your screen. 6.) Next, select the service that you would like to enable and sync with Outlook. After enabling the desired services, tap on the Save button located in the top-right corner of your screen. Your Outlook.com account will be set up on the iPhone. NOTE: Although your iPhone Mail app will try to automatically find the Outlook server settings, however, if you need to manually configure the Outlook on your iPhone, you will need to use the Outlook settings for iPhone mentioned above. Like any other email service, Outlook also presents issues to the users. Some of these common issues that iPhone users face with Outlook are listed below. This is one of the most common Outlook problems that iPhone users face. After a long use, emails, calendar entries, notes, attachment etc. get piled up in the Outlook making it quite a large application. And this is what then affects the functionality speed of Outlook. Another most annoying issue that iPhone users face is Outlook getting closed frequently. This issue generally occurs when the application gets corrupt or your iPhone is infected with the virus. Insufficient storage may also affect the Outlook sometimes. Generally, the main reason of configuring Outlook account on iPhone is to have access to your emails on the go, however, sometimes users face email synchronization issue as the mail shows up in the Desktop email client or website but not on your iPhone. This issue generally occurs when you have configured your Outlook with wrong server settings. Correcting the configuration settings with the right one can help fix the issue easily. While these are some of the common issues faced by iPhone users with Outlook, the most annoying issue that user report with Outlook is login problem. The login problem usually occurs when the account of the user gets hacked. If you even find out that someone else is having to your Outlook account or you have forgotten your account password, you can recover your account by following the below-mentioned steps. 1.) On your web browser, go to the Microsoft Sign-in page. Enter your user ID (Email, phone, or Skype) in the prompted field. Once you have entered it, click on the Next button. 2.) On the next screen, click on the Forgot my password link. This will direct you to the next screen. Then select I forgot my password from the given options and click on the Next button. You will need to select any one of the options in order to verify yourself as the rightful owner of the account. 4.) Selecting any of the top two options and clicking Send Code button will send a security code to your phone number or email address (depending on the option selected). You will need to enter the security code on the subsequent screen and click on the Next button. 5.) Then, you will be directed to the Password Reset page. On this page, enter a new password in the provided fields and click on the Next button to recover your Outlook account. Note: In case you don’t have access to your phone number or email address (in Step 3), you will need to select I don’t have any of these option follow the on-screen instructions from there on to verify yourself as the actual owner of the account. Once you are verified as the rightful owner of the Outlook account, you will be able to reset the password and get access to your Outlook account. So, this is how you can configure your Outlook account on your iPhone and start using it.